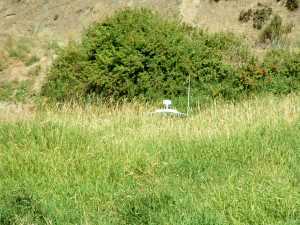 Launch: We launched at Gifford Ramp. But there are 23 ramps on the lake so there are many good launch spots. The Park Service has a chart to show the ramps that are suitable for different water levels. 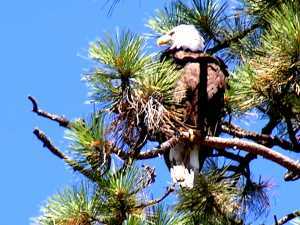 Nearby campsites: About 2/3rds of the shoreline is encompassed within a National Recreation Area, and the rest is within the Colville and Spokane Indian Reservations. 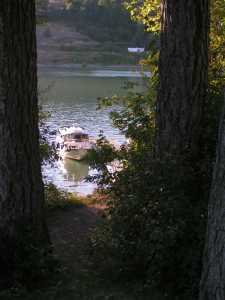 There are thirty-seven campgrounds ringing the lake. Comments: This is a large and beautiful lake. 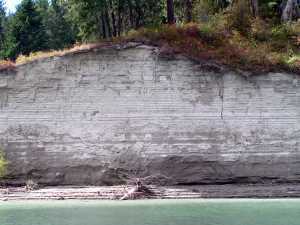 The shorelines range from evergreen forests to dryland hills. 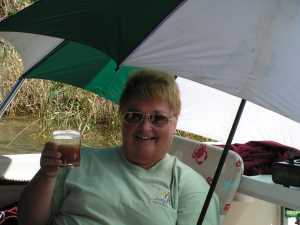 ------We launched together, with Pat and Patty, on Daydream, at the Gifford ramp. We headed out together into the gathering dusk of Lake Roosevelt. We swung the bow downriver, and the chartplotter faithfully nudged us toward the co-ordinates given to us by a friend on the C-Brat website. 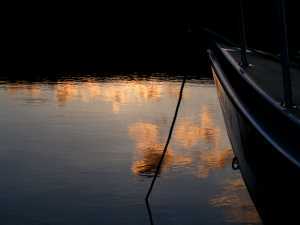 We were soon sliding into Great Cove, and with a few bats blinkering through the air around us, we set our hooks into a weedy bottom. In moments, we had rafted and were sharing tales over a sundowner. ------After dinner, we slipped the lines and pulled back to our respective anchors. Reading time, in the quiet dark of a quiet cove. Time to learn more about Lake Roosevelt. The first question we had - what Roosevelt? We quickly found it was Franklin Delano Roosevelt. Way back in 1920 he said, "As we were coming down the river today, I could not help thinking, as everyone does, about all that water running unchecked to the sea." In 1933, sitting in a Depression-era White House, FDR put his thoughts into action. In classic Euro-American thinking, he saw this as the time to stop wasting all that water, use it to turn the dry wastelands green, start the generators humming and turn on the lights, put people and the river to work. ------There was plenty of opposition to his idea - "socialism," ranted the press. "The government has no right to be in the power business - that is the domain of private, free, capitalist enterprise." "This is the beginning - the foot in the door - of Big Government entering where it doesn't belong - into American business." Interestingly, in all the debate and hullabaloo, hardly a word was raised in defense of the salmon, or the Native American culture that stretched back at least 10,000 years along the banks of the free-running Columbia. ------ Roosevelt, that master orator, pressed the legislation through Congress and soon the concrete was pouring. So were people - thirty thousand pouring into the shantytowns of Coulee, Mason City, Electric City and Tent City - there were jobs in a time of deep national depression. Soon the barrier rose -- the most massive man-made thing in America and the biggest concrete thing on Earth. Water was soon lifting through twelve massive pipes and thousands of miles of canals to water a agricultural explosion in the Columbia Basin. When all the big dams were in place, the memories of floods receded into the musings of the old-timers. Electricity soon powered the War Production Plants of the Northwest to build the aircraft, munitions, and ships for World War II. Grand Coulee was the beginning of an era - the Post-Depression Years ... the War Years. 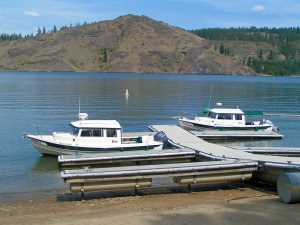 -------There are many agencies involved in the 'management' of Lake Roosevelt today- state, federal, Indian, and local. The most important to us on the lake was the National Park Service because they administer most of the left-descending half of the river and its shore as a National Recreation Area. 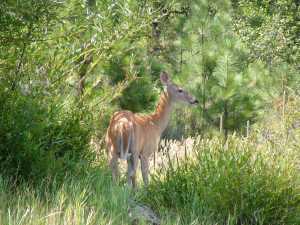 They manage many of the ramps and campgrounds, and most are excellent. 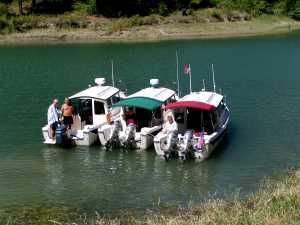 There are rules that might rankle some folks, but there are good reasons for the regulations and the rangers help maintain safety, wildlife resources, historical resources and the quality of the experience we had on the water. 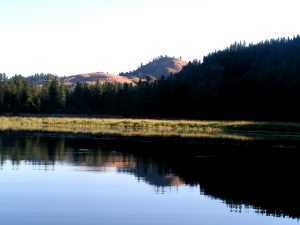 The Colville Federated Tribes and Spokane Indian Tribe have jurisdiction over almost half the shoreline and lake, and their management differences are clearly outlined in the Park Service Visitor Guide. 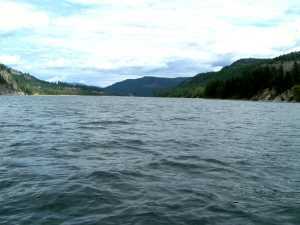 ------ As a storage reservoir on the Columbia System, Lake Roosevelt has variable water levels. Some of the ramps on the lake are unusable at low water levels. A quick look at the Park Service Visitor Guide clearly shows the usable ramps at different water elevations. The lake was down about 20 feet, and dropping, when we were there. Lake's Down - Find the C-Dory? 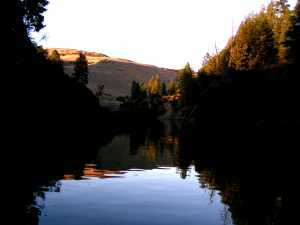 ------In late summer, storage reservoirs drop fast to regulate the water supply downstream. This is the beginning of slack time on the Columbia.-There is a natural regularity that helps maintain water levels on this river of many tributaries. In winter, when the Rockies are bound in snow and ice, the west-facing slopes of the Cascades are in their rainiest cycle and pour water into the Willamette, the Santiam, the Clackamas, and the Lewis that all debauch into the Columbia. In early summer, when the Cascades are drying, the Rockies are melting their winter packs of snow and filling the storage reservoirs of the Spokane and Snake. In summer, the British Columbia icefields are shedding meltwater into Kinbasket Reservoir in British Columbia. 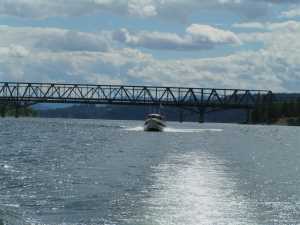 This natural organization is fortunate for boaters, and even moreso for the electrical needs of the Northwest. Storage dams supplement and utilize nature's cycles. ------ El and I have found that storage reservoirs, drawn-down, have their own simple beauty, if you can look beyond the muddy banks. Roosevelt is big and deep and beautiful any time. 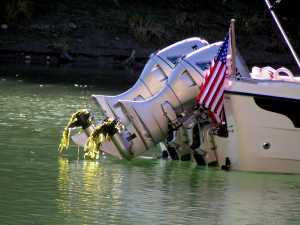 For boaters, water level affects the shoreline and its facilities - docks may not be floating, ramps may be unusable. 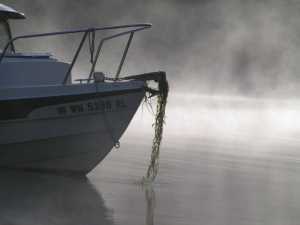 Late summer/fall boating requires prior checking and, on the water, one must be more alert to shoaling. The positive side includes fewer boats, less floating debris, and often delightful weather. 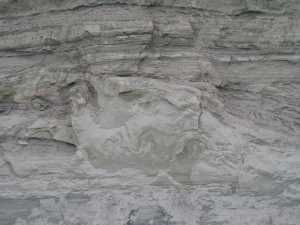 ----The geologic story is found in the tale, The Columbia Rocks, and only a few embellishments are added here. 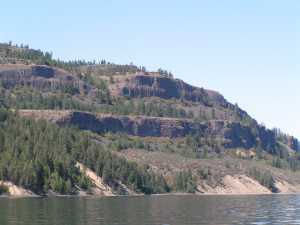 --- The Columbia River was forced northerly with each eruption of lava into the Columbia Basin. 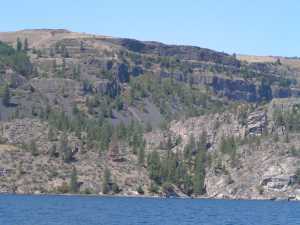 Consequently, Lake Roosevelt lies along the northern edge of the flow basalts, and much of the scenery is formed from lava beds. 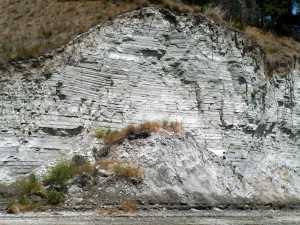 When lava cools quickly, such as along the base of a flow moving over a cold land surface, the basalt contracts into hexagonal columnar joints, or cracks. A hexagon contains the maximum interior volume with the maximum external surface area, and still nest together exactly - a perfect shape for lava to cool the fastest. 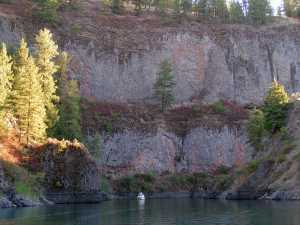 There are excellent exposures of columnar basalts in the cliffs bounding the lake. ------One of the latest geologic chapters at Lake Roosevelt involves ice. Only an eye blink ago, geologically, and we are back about 12,000 years. We are near the close of the Ice Age - a time when giant mammals rule Earth. 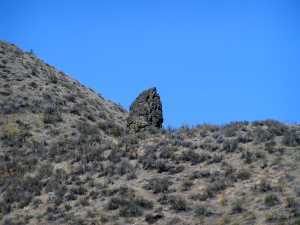 A Wooly Mammoth strolls by; a Giant Anteater rummages in the brush; Dire Wolves, big as a bear, chase an Antelope; a Sabre-toothed Cat stalks an Elk, fully twice the size of a modern Elk; and humans, armed with long spears crowned with massive Clovis flint spear points, stalk a giant Ground Sloth. The land is covered with forests of huge evergreens and the nights are cold. Glaciers still blanket the lands to the north. A tongue of ice, 3,000 feet thick, extends down to the present location of Grand Coulee, daming the ancient Columbia River with an ice dam at least ten times the size of Coulee. Glacial Lake Columbia is over 2,000 feet deep at the ice dam and stretches as far east as Idaho. Water buried the Columbia valley to the highest hills around Lake Roosevelt today. The overflow of glacial Lake Columbia carved a channel through the basalt and poured over the Grand Coulee, creating the largest waterfall on the continent. 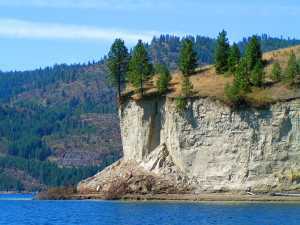 Millions of tons of sand and mud, the glacially-ground remnants of the Rocky Mountains, poured into the lake and settled to the bottom. 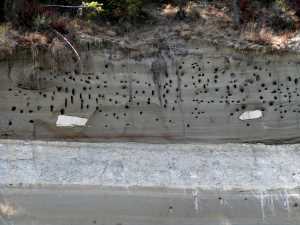 ------The story has another twist: the largest floods known to geology. Huge volumes of water from the destruction of an ice dam far to the east, in Montana, roared across eastern Washington. In places the wall of water was 800 feet high, traveling faster than 60 mph and mostly gone within two days. And there were many such floods. 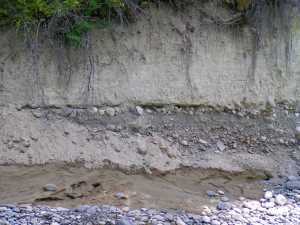 The floodwaters raged into Glacial Lake Columbia, layering silt, cobbles, and sand over the bottom sediments. Like a huge bucket of water dumped into an already full bathtub, water spilled over the rim. When the wave of water reached the ice dam at Grand Coulee, the floodwater poured over the overflow and raged down the 'spillway' channel to the Grand Coulee, where, for a few days, the thunderous roar and spume of the three-mile wide falls was the greatest ever known on Earth. 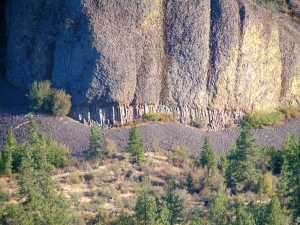 It undercut the basalt layers at the fall, and excavated a channel 900 feet deep, a mile wide, and fifty-miles long. Flooding over the Channelled Scablands, there are terraces, deltas, and dunes on a monumental scale, not fully recognized until space photography revealed the scale of devastation. 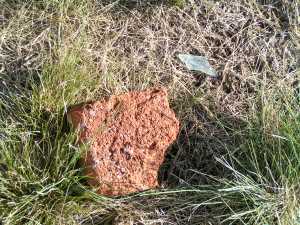 If Stones Could Speak, What Tales They Could Tell - They Can't, So We Learn to Read Rocks! 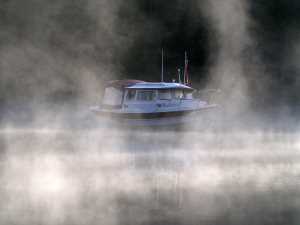 ------This is one fine lake to cruise. 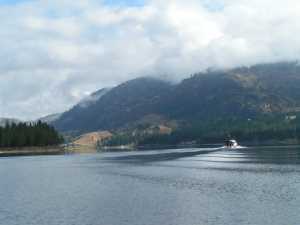 It is almost 150-miles long, with an interesting and varied 630 miles of shoreline. At the top end, the shores are towering evergreen forests and soaring mountains, and the bottom end lies in high desert sagebrush wildness. Wildlife abounds. ------That first morning, we had to decide which way to go, up or down? Ah, choices - aren't they a joy? It wasn't until after traveling extensively through the Peoples Republic of China, 30 years ago, when we observed millions who were given no choices in life, that we fully appreciated the gift of choice. Today we made a random choice, up. ------ Kettle Falls is one of the most historic and heartbreaking locations on the river. 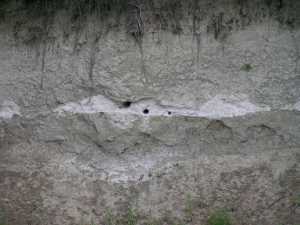 Recently, a quartzite microblade was discovered near the Falls - it was dated back 9,000 years to the Shonitkwu people. 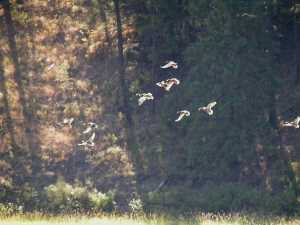 They lived by the Falls, harvesting the annual salmon run and hunting deer, antelope and small game. Their finely-worked arrowhead linked them directly to similar blades found in British Columbia, Siberia, and Europe - an unbroken chain of humanity spanning three continents. 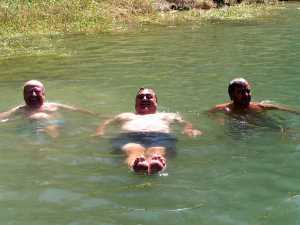 ------In the old days, the river dropped thirty feet in less than a half-mile, over rock ledges. Salmon, returning to their native stream to spawn after many years and thousands of miles of river and ocean travel, were easy to catch as they jumped the natural barrier. From mid-June to mid-September they came - a good days catch could total over 1,000 fish, some weighing more than 20 pounds. Natives from many groups came to fish, under the guidance of a Salmon chief appointed to oversea the sharing of the fish. 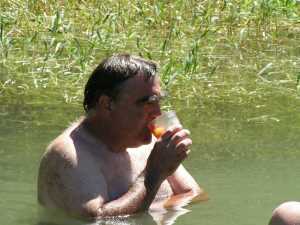 First Salmon was allowed, by the Salmon chief, to continue upriver unharmed. The next fish was ritually killed and shared, with his remains returned to the river to inform the other fish that The People treated salmon with respect. Men used traps, willow nets, and spears to capture fish. Women smoked fish and rendered many into pemmican to serve as a winter food supply. 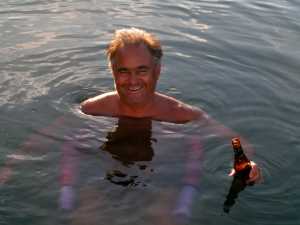 ------Kettle Falls was not only a major source of food, it was also a vital social and ritual arena. Goods were exchanged, spouses wooed and won, information shared, foot races run, and gambling games played. 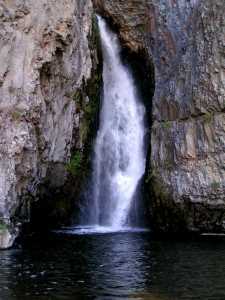 Often, there were more than 1,000 of The People at the Falls. ------For 8,500 years, we know The People lived at the Falls. It was central to their culture. Then, Europeans arrived and soon fur traders and missionaries were altering the lives of Native peoples. 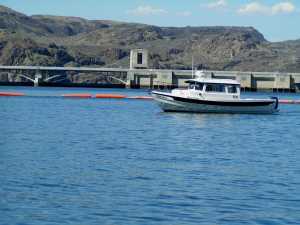 With the closing of Grand Coulee Dam, the native salmon bashed themselves to pulp against concrete, and the native fish and Native people lost their relationship. When the rising waters of Lake Roosevelt drowned the Falls, it erased the physical reminder of what, for so long, was so important. Now still water and a bridge cover the site. ------ We continued up lake. It slowly reverted to being a river. 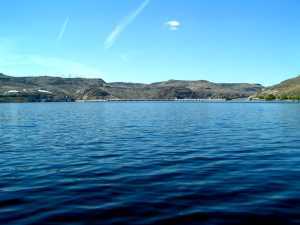 The effects of the lake became less noticeable, until we turned near China Bend where the current of the free-running Columbia swirled against our boat. 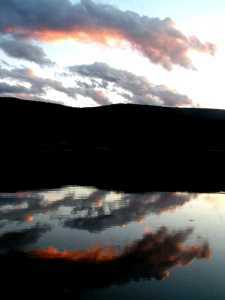 ------ That evening, back down-lake, we headed up the Kettle River to a quiet anchorage where our nearest neighbors were a pair of hyperactive beavers anxious to live up to their busy reputation. ------ The 'ka-plooosh' of the annoyed, tail-slapping, beavers reminded us to read more about the early exploration of the Northwest by European fur traders. So that evening, settled comfortably on the hook, we settled down to our reading of what life was like on Kettle River two hundred years ago. ------ There were few voyageurs or mountain men in this region in 1804. However, the fur trade to the east of the Rockies was well-developed by the end of the 18th century so trappers and traders began to cross over the mountains to the 'unclaimed' region of the Pacific Northwest. In 1805, Lewis and Clark, and his band of explorers, went up the Missouri, crossed the Divide, and down the Columbia to the Pacific, establishing an American claim to the Northwest. ------ The Hudson Bay Company had been granted by the British a monopoly trade on all furs transported by water routes into Hudson Bay. To challenge that monopoly, the French/Scottish-owned North West Company attempted to cut off the fur trade to the west of the drainage into the Bay. By 1807, they had established trade along the Columbia. 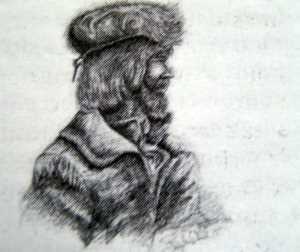 ------ David Thompson was a fur trader with the Hudson Bay Company out of Churchill, on Hudson Bay. Returning from a trading voyage, in 1788, he broke a leg. Luck in unluck - he spent his confined time learning navigation skills and the languages of the western Indians - pretty plucky for an 18-year-old. Back on his pegs and now working for the rival company, the Nor'Westers, in 1811, he started down the Columbia from the mouth of the Pend Oreille River, exploring trade routes. 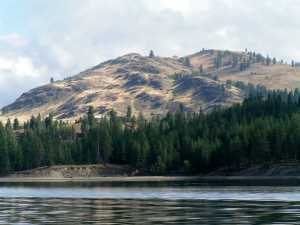 By mid-June, he was at Kettle Falls. On July 15, he stood at the Pacific. He was a detailed geographer and precise observer of the country and the people. 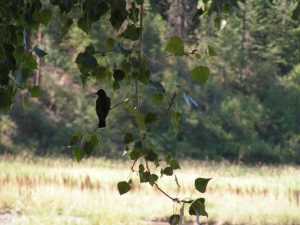 He was the first non-native to record his journey from the source to the mouth of the Columbia. A few years later, he surveyed the 49th parallel, the border between the US and (then) British Canada. The job was to take two years and he finished it in 10 months. He filled 77 notebooks with descriptions, among the most useful today for the ethnology of the Northwest Indians. In February, 1857, he died penniless at the age of 86. 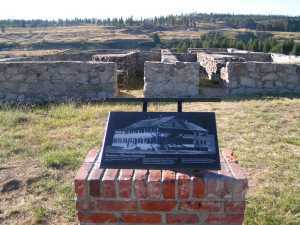 ------ The British trading companies merged in 1821,and established a trading post at Fort Colvile (near Kettle Falls) in 1825. In 1827, it was estimated that there were 1,200 Indians within their trading influence. Soon, the post was so involved in agriculture that it supplied posts as far as Hawaii and Russian Alaska. The arrival of missionaries and establishment of reservations changed the economics of the region, and fur trading diminished to insignificance. In 1845, the US Government signed treaties with Natives requiring them to give up fur trading. In 1869, Britain and the US agreed to the value of the Hudson Bay Company property south of the 49th parallel border and Ft. Colvile closed in 1871. 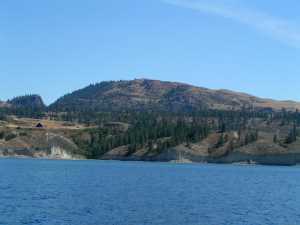 Today, the site is below the water of Lake Roosevelt. 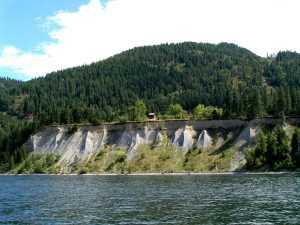 ------In 1880, the US Army established a fort at the confluence of the Columbia and Spokane River. The purpose was to protect settlers and the rights of Indians settled on reservations. A shot was never fired in anger, and in 1898 the army turned over the fort to Indians for an Indian boarding school. The school was closed in 1914 due to a lack of students, and the buildings were used for an Indian hospital until finally abandoned in 1929. 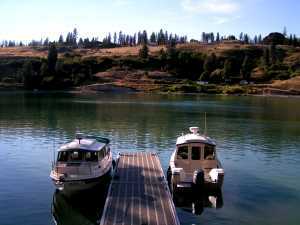 ------ The Spokane River joins Lake Roosevelt at Miles, WA. We made a brief trip up the Spokane for about 10 miles, and it was a beautiful short cruise. 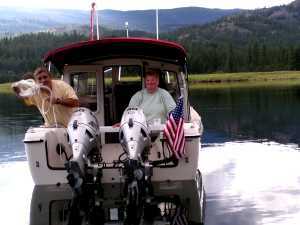 ------ We thoroughly enjoyed our cruise on Lake Roosevelt, and a few pictures will illustrate why.